Itharku melayum asai padu Balakumara..
What a way to spread awareness on drunk and drive. A brilliantly executed comedy drama where each and every character counts to perfection. Aswin, Vijay Sethupathi, Pasupathy, Robo Shankar and the list goes on. Vijay Sethupathy's innovative comedy track has set a benchmark of its own and proves actor's disciplined approach in portraying a middleclass colony being in Chennai. However, again food for thought being can such stalking should keep being featured in mainstream cinema? 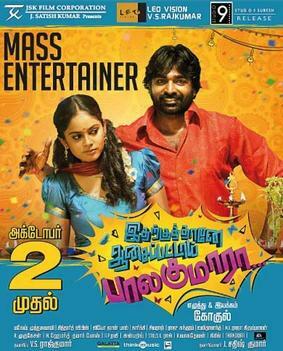 Although, it was enjoyable watching Vijay Sethupathy do it.